Are you one of those people who is constantly thinking about where your next meal is coming from? Or are you one who, when you are stressed, busy, or simply have your attention elsewhere, sometimes forgets to eat? Whichever category your meal-planning style (or lack thereof) is, this Sugar Cookie Overnight Protein Oatmeal has you covered. This may not come as a shock to you, but I am definitely one of the “next meal” people. And next snack. I even sometimes fall asleep at night thinking about what I’m having for breakfast the next day. When you have something as delicious as high-protein overnight oatmeal that tastes like a sugar cookie waiting for you in the refrigerator, it’s easy to do! 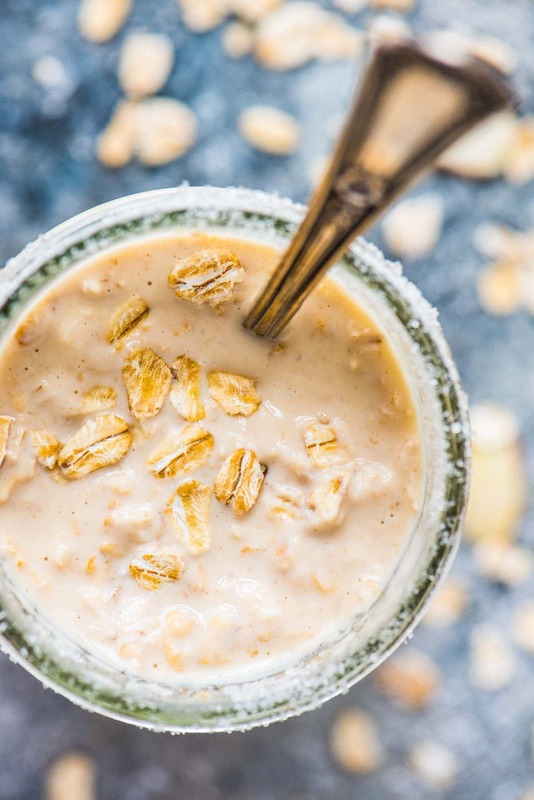 This high-protein oatmeal recipe is essentially classic overnight oats, with a few simple tweaks to make them extra high in protein, and, I must say, extra tasty too. Every serving packs a whopping 26 grams and is less than 300 calories! Part of the reason I am so often thinking about my next meal (aside from the fact that I ♡ food) is that when I’m hungry, I morph into a grouchy, disgruntled bear. It is not pretty or pleasant for those around me. Protein is one of the most important ingredients for keeping you fuller, and thus happier, for longer. 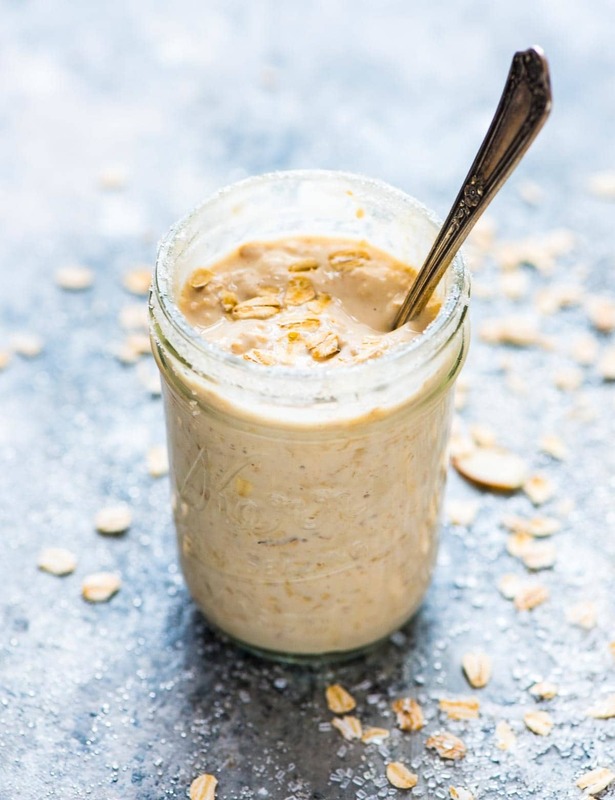 Whether you are a pro meal planner who always has a snack in your purse or you would forget to eat if someone didn’t remind you, overnight high-protein oatmeal is an ideal way to make sure that a) you start every day with a healthy breakfast (so important!) and b) that breakfast actually sustains you. I find that if I have a generous serving of protein in the morning, I maintain better eating habits the entire day. Because overnight oats can last in the refrigerator all week, if you make a big batch, you only need to remember to mix them up once. I like to stir mine up on Sunday night, then for the entire week I never need to think twice about what I’m eating, no matter how busy my mornings become. Two ingredients contribute to this overnight oatmeal’s high protein count. The first is Greek yogurt. It offers 12 grams in a half cup and makes the protein oatmeal taste extra rich and creamy too. The second is whey protein powder. If you think that protein is only for serious athletes or body builders, it’s time to reconsider! I started adding whey protein to my smoothies and using it to make no-bake protein balls about a year ago, and I am never going back. It makes recipes more filling, and I also find that if I drink protein after exercising, I’m less sore the next day. Plus, if you buy the right brand, whey protein is super yummy too! For today’s recipe, I used this vanilla protein powder. Its creamy vanilla flavor mixed with the oatmeal, along with a bit of vanilla extract, almond extract, and a touch of sweetener (I used coconut sugar, but brown sugar, honey, or maple syrup would be lovely too), makes this protein oatmeal taste just like a sugar cookie! I felt like I was eating dessert for breakfast in the best possible way. While this Sugar Cookie Protein Oatmeal tastes great as the recipe is written, you can also use it as a starting point to add all sorts of toppings. Blueberries, orange zest, and pecans was one of my favorite combos, and apple cinnamon is classic too. Sugar Cookie Overnight Protein Oatmeal. Healthy and PACKED with 26 grams of protein. This delicious, high-protein breakfast will keep you full all morning. Briskly whisk the Greek yogurt, almond milk, and protein powder together in a mixing bowl or large measuring cup, or shake them together in a mason jar so that the protein powder is as well incorporated as possible. Add the oats, coconut sugar, vanilla extract, almond extract, and salt. Whisk to completely combine. Cover with plastic wrap (or seal the lid of the jar) and refrigerate for 8 hours or up to 5 days. When ready to serve, stir once more, then transfer to a serving bowl. If the mixture is too thick for your liking, thin with a little extra almond milk. Sprinkle with any desired toppings and enjoy immediately. 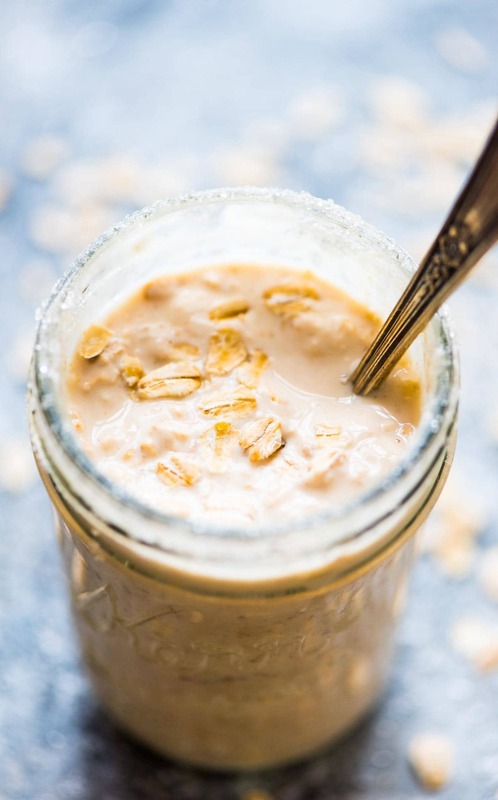 Leftover overnight oats can last in the refrigerator for up to 5 days. I am definitely a meal planner too! I cannot fathom the thought of not knowing where my next meal is coming from, it produces tons of anxiety haha! 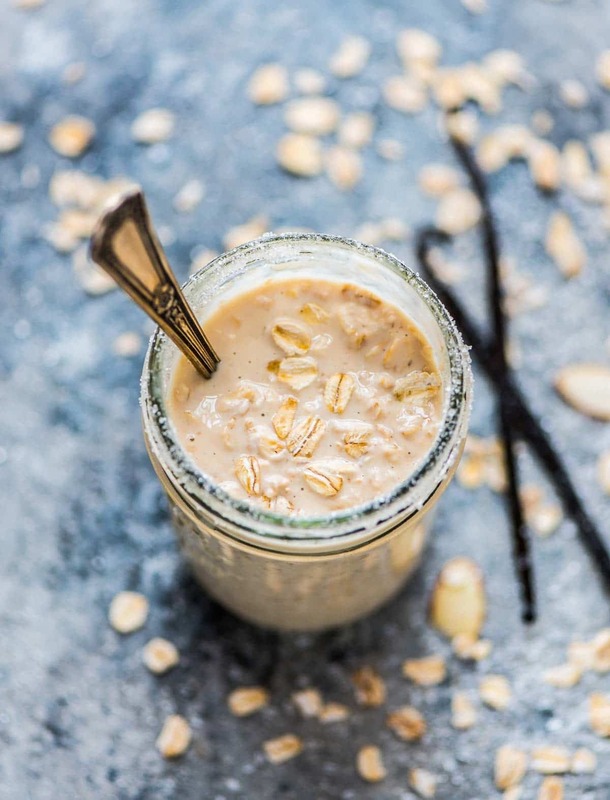 The over night oats sounds amazing! Sugar cookie flavor with tons of protein at breakfast time? YES PLEASE! These overnight oats definitely help with that, Bethany! :) Thanks so much! Jam would be a delicious topping, Susan. Great idea! I hope you enjoy the recipe! Can you heat this? I just can’t do cold oatmeal . Excellent question, Shandra. Yes, if you don’t enjoy oatmeal cold you can certainly heat it up! Very good! Made them last night. Not sure how I would like cold oats but I love the amount of protein in them and how full I was afterward. I’m glad to hear you enjoyed the recipe, Annette! The fullness factor is something I really enjoy about these oats too. Thank you for taking the time to leave this nice review! I made this last night and ate this morning. I didn’t have protein powder so used extra oats. I also added raisins, chia seeds and unsweetened coconut. I used agave syrup instead of sugar. I could only eat half and look forward to tomorrow’s breakfast. It was easy, excellent and very filling! Thanks Erin. Awesome, Coleen! I’m so glad to hear you enjoyed the recipe. Those additions and swaps sound great! Thank you so much for taking the time to leave this wonderful review! Am curious if instead of using whey protein powder I can substitute 2 T of a protein meal shake powder? Are those interchangeable? Hi Amy! The two are actually pretty different. Protein shakes usually have extra ingredients other than the protein to create the “shake” aspect, which could affect the oats. You could certainly experiment, but I’m afraid I can’t vouch for the results, since I’ve only tested the recipe with whey protein. If you do decide to try it, I’d love to hear how it comes out! I am eating this right now & LOVE IT!! I knew when I licked the spoon last night that it was going to be a good one. So happy I made a double batch … already excited for breakfast tomorrow. YAY! I’m so glad you’re enjoying the recipe, Amy. :) Thanks for taking the time to leave this review! Hi Sara, I’m sorry to hear that. As you can see from the other comments, others have liked the recipe very much, but everyone has different tastes! I’m afraid that overnight oats are somewhat mushy by nature. If you’re looking for a breakfast with oatmeal but a firmer texture, you could try my chocolate chip pumpkin bars or banana oatmeal bars! Oh my lanta, is this good! I was skeptical, but it tastes EXACTLY like a cookie like you said! I’ll have to come back back and rate it. Thank you, Sasha! I’d love to hear what you think. Decided to give this a try…finally. Could steel cut be used as a substitute? I don’t really care for rolled oats cooked the traditional way but I do like steel cut oats. Thank you for always answering my questions! Hi Chris! I’ve never tried the recipe with steel-cut oats, but both the liquid needed and the texture would be different. A few recipes I saw online call for a 2:1 ratio of liquid to oats, which is a little more than called for here. Rolled oats would be the safest bet since that’s how I tested the recipe, but if you do give it a try with steel-cut, I’d love to know how it goes! Tried this today. I used skim milk, omitted the coconut sugar & used butter extract instead of almond extract. It was thick so I added some water. Stirred in some Fiber One original – yum! I’ve tried greek yogurt in overnight oats before & didn’t like the chalky taste. I think the protein powder took care of that. Thanks for the recipe! Kelli, I’m happy to hear you enjoyed the recipe! Thanks for taking the time to share this great review and the tweaks you made! Can you make this with plain yogurt too? Hi Stacy, yes, I think that should work! This is such a great, filling breakfast and super tasty too! I have made it numerous times, including a version with chocolate protein powder and an added scoop of peanut butter. I look forward to having this in the morning tomorrow! Thanks for this awesome recipe Erin!! Sooooo happy to hear that Elizabeth, THANK YOU! I double this recipe and then eat it throughout the week! Best way to eat it: add the lemon zest when you make it (SO good), serve over sliced strawberries and drizzle almond butter on top. AMAZING! Elaine, I am so happy to hear this and your additions sound DELISH. I’m going to try it myself that way too!